Leaders across party lines on Monday condoled the death of former Lok Sabha speaker Somnath Chatterjee, describing him as an outstanding parliamentarian who enriched Indian politics. Chatterjee, 89, passed away at a private hospital in Kolkata on Monday morning following multiple organ failure. Tributes poured in as news came in of the death of the 10-time Lok Sabha MP who had joined the Communist Party of India-Marxist in 1968. Chatterjee was speaker of the Lok Sabha from 2004 to 2009. President Ram Nath Kovind condoled the loss by posting on Twitter. 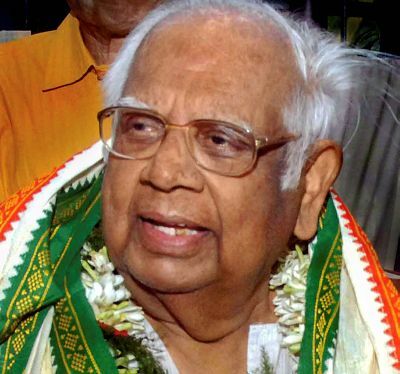 “Sorry to hear of the passing of Shri Somnath Chatterjee, former Speaker of the Lok Sabha and a veteran parliamentarian who had a forceful presence in the House. A loss for public life in Bengal and India. My condolences to his family and innumerable well-wishers,” he wrote. He was a stalwart of Indian politics, Prime Minister Narendra Modi said. “He made our parliamentary democracy richer and was a strong voice for the well-being of the poor and vulnerable,” an “anguished” prime minister said, adding that his thoughts were with Chatterjee’s family and supporters. Congress president Rahul Gandhi said Chatterjee was an institution and greatly respected and admired by all parliamentarians, across party lines. Conveying his condolences to Chatterjee’s family and supporters, Bharatiya Janata Party chief Amit Shah said Chatterjee was an excellent parliamentarian. His long years as a member of the House enriched parliamentary traditions, he added. “He was a remarkable human being, an eminent parliamentarian and a very clear headed speaker of the Lok Sabha. I convey my heartfelt condolences to the bereaved family,” said former vice president M Hamid Ansari. Former prime minister Manmohan Singh on Monday condoled the death of former Lok Sabha Speaker Somnath Chatterjee, saying the country has lost a “great leader”. Singh offered his condolences in a letter to Chatterjee’s wife Renu, describing him as a good orator, an exceptional public servant and an outstanding parliamentarian. “In his death our country has lost a great leader who always stood for the cause of the poor and the downtrodden classes of society. “He was a very good orator, an exceptional public servant, and an outstanding member of parliament, especially in the role of speaker of the Lok Sabha, which made him eligible for the ‘Outstanding Parliamentarian Award’,” he said in his letter. Singh, who was the prime minister during the United Progressive Alliance government, said Chatterjee’s ability and personality was such that people from all walks of life and from all political parties loved and respected him. “His services to the nation will be remembered for many years to come,” he said, while conveying his heartfelt condolences to the family on the bereavement. Lok Sabha Speaker Sumitra Mahajan also condoled the death Somnath Chatterjee, saying that his tenure as the speaker of the Lower House was a guide for her. Recalling her long association with Chatterjee, Mahajan said he was from a different ideology, but was always kind to her. “I am observing Somnath da from the very first day I entered Parliament and I have learnt a lot from him. He was a big brother to me,” Mahajan said. She further said Chatterjee’s tenure as the Lok Sabha speaker was a guide for her and he established that the speaker’s post was above politics by refusing to step down from his position. Veteran BJP leader L K Advani condoled the death of former Lok Sabha speaker Somnath Chatterjee, saying he was an inspiration for upcoming parliamentarians. Chatterjee was a distinguished and outstanding parliamentarian and had a forceful presence in the House. He strongly advocated for the independence of the Lok Sabha speaker’s chair, Advani said in a statement. “He was a man of committed ideals and was an inspiration for upcoming parliamentarians,” the BJP leader added. Delhi Chief Minister Arvind Kejriwal echoed him and termed Chatterjee one of the “greatest parliamentarians” of contemporary times who will also be remembered as one of the greatest Lok Sabha Speakers India has ever had. External Affairs Minister Sushma Swaraj said Chatterjee and she shared a very cordial relationship despite their ideological differences. He was principled and scholarly, and played a significant role in India’s parliament, Defence Minister Nirmala Sitharaman said. Union minister Arun Jaitley said he will be remembered for his contributions which enriched Indian politics and was an outstanding Parliamentarian. According to former finance minister and senior Congress leader P Chidambaram, Chatterjee had through his life been a democrat, a liberal and a champion of enlarging the constituency for social democracy. Nationalist Congress Party supremo Sharad Pawar said Chatterjee was a dignified person who set high standards of conduct during his stint as the Speaker of Lok Sabha. The passing away of “Somnath Da” is great loss for us all, West Bengal Chief Minister Mamata Banerjee said in her condolence message. Who says the Left is dead in India?